Keeping up the recap so far of 2016 on the blog today is another Story Frame. This time from Mel & Ken and their gorgeous Luxury Marquee Wedding at Newburgh Priory a few weeks ago. This wedding has really set the bar for 2016 incredibly high, it was full of laughter, had some wonderfully tender moments of real emotion and also had an absolutely killer dance floor. Which is pretty much everything I want to photograph each week! As promised I’ll be bringing lots and lots of full weddings to the blog throughout the summer and rest of the year but when things are a little hectic I’m just going to drop the occasional Story Frame on you all with a frame that has knocked my socks off and made me smile for days after taking it. Lets be honest, this doesn’t need a whole heap of explaining and is all the better for it. Its the speeches. Its the mother of the bride. 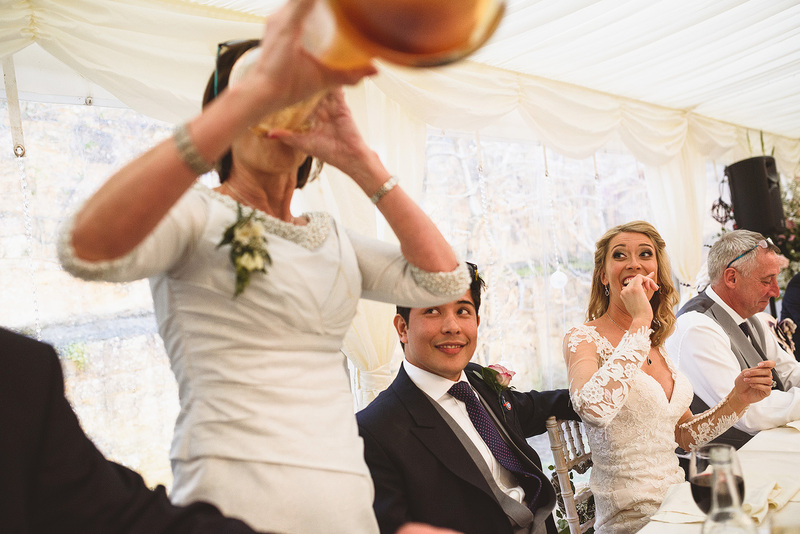 And she’s ambitiously attempting to down a Yard Of Ale at the top table to the gasps and cheers of all those around her including her daughter and new son in law. Definitely one of the best things I’ve seen at a wedding yet!